Left photo: FMS 8th grade students Iman Ahmed and Renelle Chesson; Right photo: FMS 8th grade student Elizabeth Nordin. 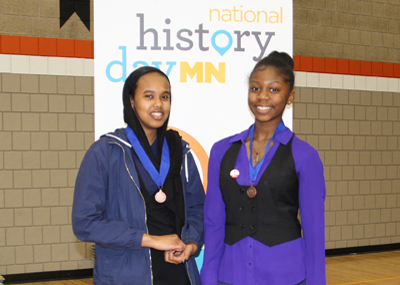 Congratulations to the nine Fridley Middle School (FMS) 8th grade students who were selected to advance to the National History Day state competition! 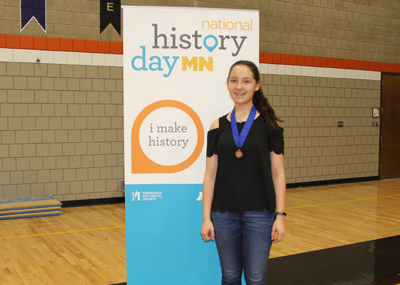 A total of 35 FMS students competed at National History Day regionals on March 23, 2019 at White Bear Lake High School. 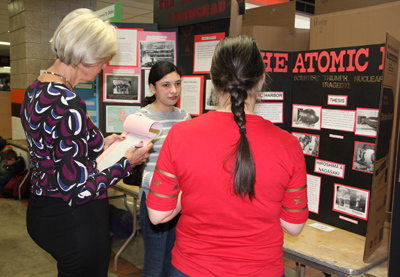 The National History Day state competition will be held on Saturday, May 4 at the University of Minnesota-Twin Cities campus. The top entries from the Minnesota state event will be awarded the opportunity to compete at the national contest at the University of Maryland-College Park in mid-June. 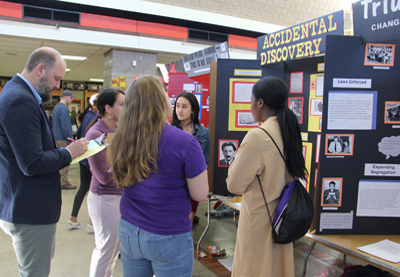 National History Day is an interdisciplinary research project that allows students to explore world issues and develop their inquiry and research skills. The International Baccalaureate Middle Years Programme at FMS focuses on allowing students to develop their Approaches to Learning (ATL) skills, which includes self-management, communication, research skills, social skills and critical thinking skills. The National History Day project is an excellent opportunity for students to put these skills into practice, empower them to meet challenging objectives, and helping foster critical skills that will prepare them for future success. Great work to all our students, and best of luck to the students who are advancing to state!